Mumbai: Fears that the slowing Indian economy could be reflected in the financials of its companies intensified on Thursday with initial numbers on the advance tax paid by them this quarter showing almost no increase from last year. 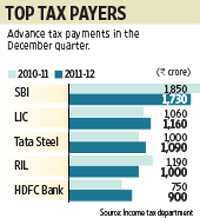 The advance tax paid by around 65 companies, including Reliance Industries Ltd (RIL), the largest private sector firm by market value, and State Bank of India (SBI), the state-owned lender that is India’s largest, remained almost flat in the December quarter when compared to last year, showing a 0.13% increase. Income tax officials in Mumbai said more numbers are coming in and that a clearer picture is expected by the weekend. They added that the growth across the universe of companies that pay advance tax could be in the high single digits, a mathematical possibility that will require firms whose numbers have thus far not been taken into account to pay far more tax this quarter than they did in the same quarter last year. Mint’s P.R. Sanjai says third quarter advance tax collections from Mumbai-based companies has been desultory. Two officials, who did not want to be named, admitted that the country is unlikely to meet its direct tax collection target of ₹ 5.85 trillion for the current fiscal year, an eventuality that will strain the government’s already-strained finances. India’s economy has been hit hard by persistent inflation, high interest rates, the lack of investment-friendly policies and reforms, and, to a lesser extent, the crisis in Europe. 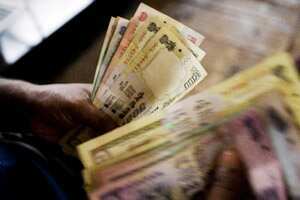 “Considering the rupee’s depreciation and external shocks, Indian companies will be unable to perform well. And, on realistic terms, Mumbai cannot reach its target," one of the officials told Mint. Mumbai accounts for about 35% of India’s total direct tax collections and contributes ₹ 2.04 trillion to the kitty. Indian companies pay advance tax a fortnight before the end of every quarter on their projected earnings and these numbers are seen by analysts and experts as a proxy for their financial performance, a relationship that usually holds up (it sometimes doesn’t). In keeping with the norms laid down by the Income Tax Act, companies are required to pay 15% of their total advance tax in the first quarter, followed by 30%, 30% and 25% in the next three quarters, respectively. “Things are going from bad to worse. We can’t expect more (tax payment) in the coming quarter. Public sector banks and oil companies are the worst performers in terms of advance tax payments this quarter, while cement makers and foreign banks are the best," the second official said. RIL paid ₹ 1,000 crore advance tax for the December quarter, compared with ₹ 1,190 crore in the corresponding quarter of last year. SBI is the highest taxpayer in the Mumbai circle and paid ₹ 1,730 crore, against ₹ 1,850 crore. Tata Motors Ltd paid almost one-third of what it paid last year— ₹ 80 crore against ₹ 220 crore. There are some surprises. Bajaj Auto Ltd has paid ₹ 450 crore, 21% more than what it had paid last year— ₹ 370 crore. Ambuja Cements Ltd paid ₹ 115 crore, 91.66% up from the comparable quarter of last year. And HDFC Bank Ltd paid 20% higher advance tax at ₹ 900 crore, while Hongkong and Shanghai Banking Corp. Ltd paid ₹ 420 crore, up 110% over last year. These, though, were exceptions and the general trend remained flat. “Slowing advance tax numbers suggest that corporate margins are getting increasingly squeezed, both as the economy slows and input costs rise, further fuelled by the sharp currency depreciation. This also suggests that tax revenues, and therefore the fiscal deficit, will continue to be pressured," said Sajjid Chinoy, India economist, JPMorgan Chase and Co. The advance tax numbers assume significance because India’s factory output contracted 5.1% in October, indicating the economy is slowing at a faster pace than was expected. Factory output has been in single digit since November 2010. To add to the woes of Indian firms, the local currency has been depreciating fast against the dollar, pushing up the cost of imports in rupee terms. Some companies are also being hit because they hadn’t hedged their foreign currency loans. On Thursday, the rupee fell to a new lifetime low of 54.60 to the dollar as concerns over global economic growth drew investors towards the US currency. It recovered to end at 53.64 per dollar, up from 53.72 per dollar on Wednesday after RBI started selling dollars. Since August, the rupee has depreciated 16.6%, the most among Asian currencies. Finance minister Pranab Mukherjee said on Wednesday that the emphasis needed to shift to growth. The economy expanded 6.9% in the second quarter following growth of 7.7% in the first. “Our monthly industrial growth has slowed sharply for the month of October. This is partly a reflection of global trends, but our own fight against inflation has also taken a toll on investments by our corporations. We must turn our attention to reviving growth as quickly as possible," the minister said. Ritika Mankar, economist at Ambit Capital, said advance tax numbers only provide “an additional evidence" of the slowing of the economy rather than being “a leading indicator". She said there is no one-to-one correlation between advance taxes and quarterly economic growth, and added that the numbers need to be weighed with a bit of caution. “Annual tax payments make more sense as the tax rates are never static and there is always a tax refund mechanism involved. On a broad basis, we retain our view that India’s GDP growth will settle at 7.1% for FY12 and may slip to 6.2% for FY13." Still, Bollywood seems slowdown-proof. Actor Akshay Kumar paid ₹ 6 crore for December, the highest among film stars. He paid an identical amount in the year-ago quarter.